Forum Index > Historical Arms Talk > Viking/Saxon scabbards and Clontarf Mod. from Todsstuff. Posted: Thu 10 Apr, 2008 4:28 am Post subject: Viking/Saxon scabbards and Clontarf Mod. from Todsstuff. I collected these from Tod a couple of days ago, and now that I've got some pictures sorted I thought that I would share them. I wanted something that would fit the time period of the swords, Albion's Thegn and Clontarf, and specified the first half of the 10th century AD, the rest was left to Tods discretion as to how he would proceed. 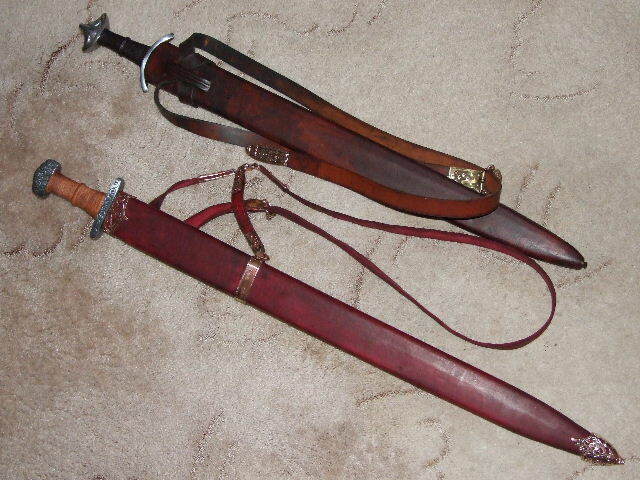 Both have the usual wooden core/leather outer but they also have a fleece lining which I particularly like, the swords are held nice and snug, but the draw is really smooth and easy. I'd say this is the best balance between holding the sword in place, but at the same time being able to get the sword out without difficulty, that I've come across so far. 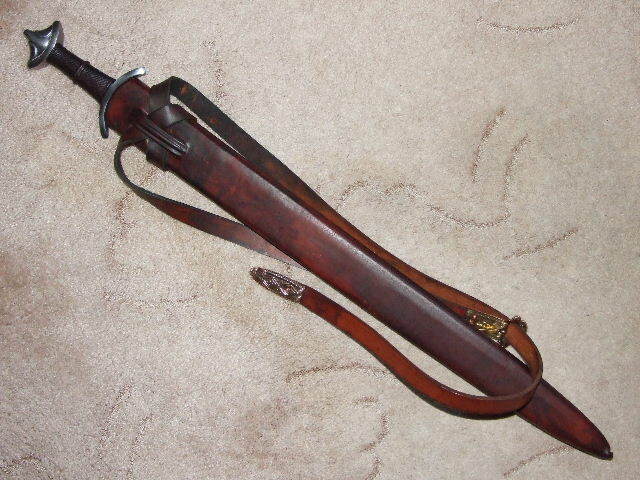 Both of the scabbards have baldrics which would have been held against the body with a belt, which would also help to relieve the weight of mail armour in the standard fashion. 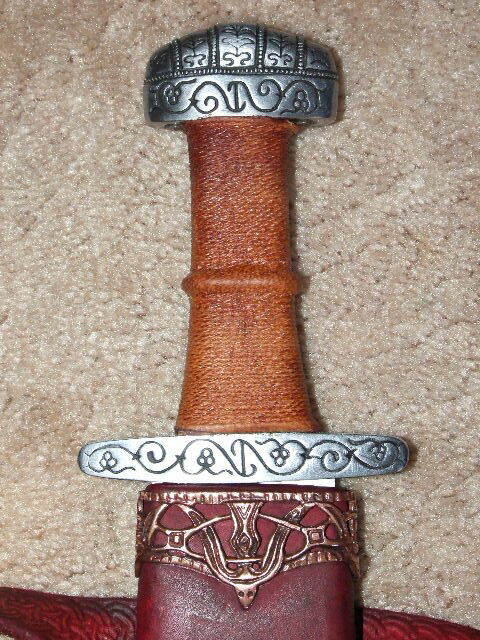 As you will see from the pictures the Clontarf scabbard is far more elaborate than the Thegn's. After some research it was decided that the Saxon gear was far less likely to have the level of decoration that we see on Viking gear. We do have records of Alfred giving presents of swords with elaborate scabbards to family members, but outside of the royal family swords would been pretty rare, and it was felt that even if someone was lucky enough to own one the scabbard would have been fairly plain. As much as anything the Saxons of this period just don't seem to have had the same taste for ostentation as their Viking Counterparts. To carry on from the above post, the modification to the Clontarf is that the grip has been changed. This is something that came out of a number of discussions about how the sword would have been held and used, and generally how uncomfortable a lot of people seem to find these particular hilts. Personally I've always thought that the grip on the Clontarf was far too skinny and the taper just served to slide the hand into the pommel. After looking at surviving examples of hilt components, and discussing with people like Tod and Paul Binns, I decided to see what effect a more waisted grip would have on this sword. With this in mind Tod removed the old grip and built up either end to give it a bit more meat at the pommel and guard. This leads to a distinct narrowing through the middle of the grip where a large cord riser has been added. I have to say that as soon as I picked the sword up I noticed the difference. The shape of the grip holds the hand in the centre without allowing it to slide towards the pommel, and the riser fits nicely between the middle two fingers, giving even more security. The end result is a sword that is much easier to swing and recover than it was before, and I can only say that this is a huge improvement. I think that grip looks awesome! And the looks are just icing on the cake if it works better in the hand for you. Based on my own experience modifying grips on some of my swords I feel that to get the most potential out of any given sword you might need to reshape the grip to fit the owners hand. The shape of the grip can totally affect the way it feels and performs. 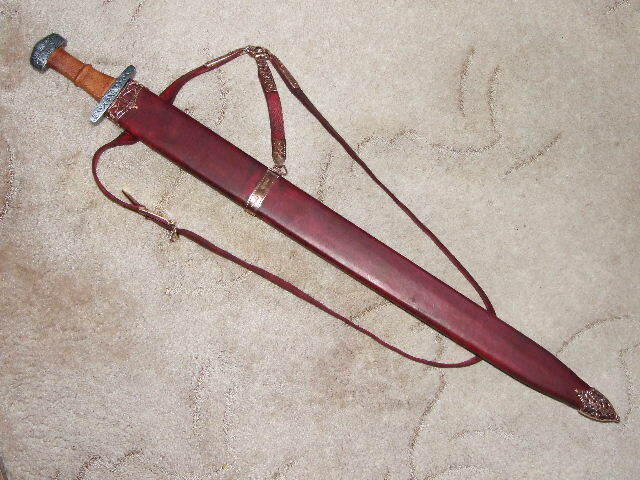 The scabbards are beautiful and really show Tod's skill with scabbards and metalwork. The finish on the leather is very nice.